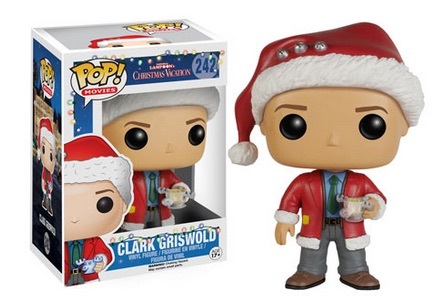 2015 Funko Pop Christmas Vacation immortalizes the main characters of the popular movie as vinyl figures. 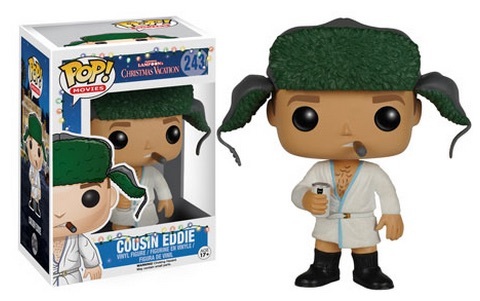 Both Clark Griswold and Cousin Eddie receive the Pop! treatment in the Christmas Vacation line. A holiday staple and comedy classic from the end of the 1980s, National Lampoon's Christmas Vacation tells the tale of the Griswolds' family Christmas. Based around a series of bad luck and unfortunate relatives, Chevy Chase as Clark Griswold is the central character in Christmas Vacation and Randy Quaid as Cousin Eddie is the main source of frustration. Clark Griswold's Pop! figure includes a santa outfit and the iconic moose mug. The thorn in Clark's side, Cousin Eddie is dressed in a white robe with his green trooper hat. He also holds a beer can and has a cigar in his mouth. The 2015 Funko Pop Christmas Vacation vinyl figures stand approximately 3 3/4" tall and are numbered as part of the Pop! Movies line.